‘Das Krypti-Kleen Roadkill Vaschung-Maschine’ Help! I received this gift horse about a week ago and after effusive thanks I settled down to do a first ceremonial load of wash… only to discover that one look into the horse’s mouth revealed a set of teeth, well, you decide. Take a quick look at the Kontrol-Panel below and come right back for the rest of the story. Now tell me: is this what Das Future looks like? An array of Buttons and lights whose purpose is known only to the lucky millionth monkey who methodically (and randomly) tried all 965 million settings?? OK, I know what you’re thinking: ‘The Owner’s Manual’ duh! german only. 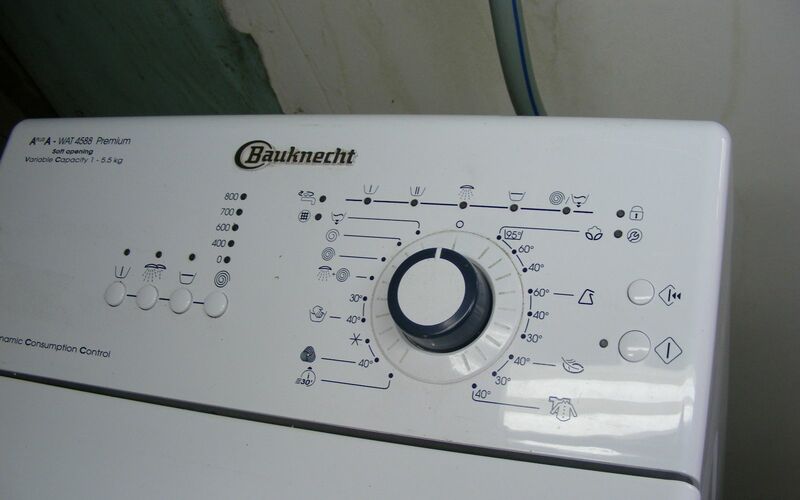 ‘Bauknecht’ is a german firm, the actual device is made in Slovakia, and ownership of the company is now in the hands of Whirlpool, not that that helps me much. The Manual says, as you might have guessed,’Don’t put infants in the drum, don’t chew on the power-cord, don’t wash aluminum clothes in Hydro-chloric acid’… stuff like that there. But not a word, not one solitary clue, as to the function of any of the hieroglyphics on the Dashboard. They do say ‘See Program-Table’ about five times, but said table existeth not. And also is absent from the English translation, which I managed to procure, just to check my comprehension, after wasting an hour on the net (and skillful foot-work in order not to install the bundled Virus/Toolbar for Viagra Casinos.) Anyway, the English version added nothing new. So far, the Truth, and nothing but.. So I did coax it into doing a test load of laundry: three pair of pants, two sweatshirts and a couple socks. Took three hours, blew through 12 gallons of precious drinkable water, and the clothes were sopping wet when it finished. Sorry, Bauknecht (‘Bow not thyself down to false appliances!‘ (my translation), I spent too much time in America, where you just throw the wash in the drum, turn to ‘Regular’ or ‘Wash-n-wear’ hit ‘Start’ and a half hour later you’re done. what’s so hard, even here in the third world, in copying simple success? So bottom line, what is to be done? Well, trial and error has enabled me to ‘Rosetta-stone’ the hieroglyphics, and here is the deal. Refer now to the second photo, where the buttons are finally de-coded! ‘A’: You press this button as many times as you like, nothing happens. But probably, if you feel like it, the ‘400’ lights up after 400 presses. Who cares though? ‘D’ is of course the cycle used for washing wrenches and other hand-tools. (This one was a cinch to decipher. ‘L’ is for washing lab-ware, retorts, graduated cylinders, condensers and the like. I think it has a slow spin-cycle, but I haven’t tried it. ‘F’ is, you guessed it, for washing feathers, feather-boas, Swiss hats with feathers, and possibly stuffed birds. What’ll they think of next? Answer: “K’ !! As you can see, this cycle is for laundering all types of roadkill. From hapless pedestrians, their shirts (and bodies) flattened by hundreds of thoughtless motorists, down to the odd bloodied armadillo you need to clean up a bit before serving to your mother-in-law for her hopefully last birthday, Das Vaschung-Maschine seems to have covered all the bases. My only beef is the time it took to figure it out. Should have posted this the day it arrived, but I didn’t have a thing to wear. This entry was posted in Uncategorized and tagged appliance problems on January 17, 2014 by solberg73.